Please note: this review was originally posted to Evie's Lifestyle one year ago. This is a re-post. Victoria is now 16 months, though she still very much enjoys playing with this teether! Got a teething baby? Welcome to the club! Oh the joys of sleepless nights (and just when you thought you could finally get some sleep, too, silly you!) and constant whining.. whining... whining... I won't lie, I was slowly approaching the point when I was willing to let my child chew on my phone, cause this seemed to be the only thing that a) held her attention long enough and b) was easy for her to grab and hold (my future tech whiz!). We tried many different chew toys - from the ones filled with liquid that you can toss into the freezer for the awesome (or awesomely short-lived?) cooling effect to the fancy shaped ones, like Sophie the Giraffe. The last one really is a nice chew toy, by the way, just not for a 5 month old baby that is still a bit uncoordinated and, therefore, fully capable of poking her eye out with it (true story). 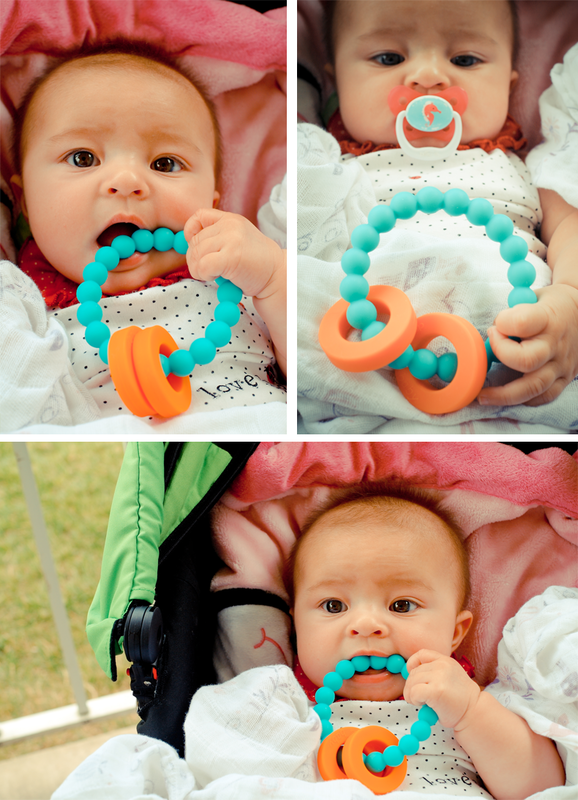 And then I discovered the wonderful Chewbeads and their Mulberry Teether bracelet/chewing ring. And while my life didn't get a whole lot easier - I still don't get much sleep and I'm still mostly covered in Victoria's various liquids from which her saliva is the most pleasant one - it definitely got bearable again. Hallelujah! We got the teether in turquoise and orange, because I know how much Victoria loves bright colors. It immediately caught her attention - shake that thing in front of her eyes and she's sure to reach out for it. The look is one thing, but the texture is just as amazing. I just love how soft the beads are. They're made from silicone and don't have any unpleasant smell. V loves chewing on them! They provide enough friction for her to be able to hold them without any problems. She seems very content just sitting there, chewing on her bracelet, for as long as 30-45 minutes at a time. Not even mommy's shiny new phone can hold her attention for THAT long. With all the other chew toys we've tried, Victoria would quickly get very frustrated. She's got Korean blood in her, mind you, so it doesn't really take long for her to get annoyed and throwing things around. This is by far the only teether she didn't get frustrated with. It's so easy for her to hold, put in her tiny mouth and chew, she really doesn't seem to have anything to be frustrated with at all. Moreover, looking at her sitting in her stroller or excersaucer, chewing on the Mulberry Teether, I can tell she's relieved and satisfied. She will chew on it until she gets tired enough to take a nap. Everyone is happy! I won't lie to you, I have my own agenda in owning this particular teether. It's stylish and makes for a fantastic accessory! I have tried wearing it a few times while carrying Victoria in the carrier, and she was happy to have something to chew on while we walked the dog together, or did grocery. It's really quite a convenient baby product. You don't have to worry about it falling to the floor and getting dirty, you don't even have to think about it, really, you just wear it, and baby will do the rest. Last, but not least, the Mulberry Teether doesn't contain any harmful substances, such as BPA, phthalates, cadmium, lead or metals. It's perfectly safe for your child to chew on, and that's always the first thing I check before I make any purchases. 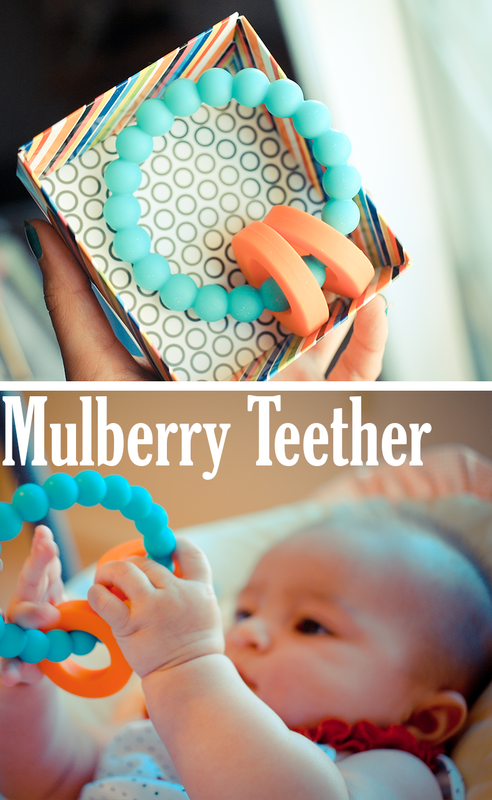 To sum it all up: The Mulberry Teether from Chewbeads is a product I feel 100% comfortable recommending to all moms. It's hard for me to even imagine a better teether for my baby. Give it a try and I promise you, you won't regret! Disclaimer: I received a free sample of the product from BellyDanceMaternity.com, a NY based baby/maternity store that has sadly closed since. This did not influence my review in any way. All thoughts and opinions are my own.